Many of my readers will view the graphic on the left and immediately conclude there are only two mindsets: Christian and unbeliever. 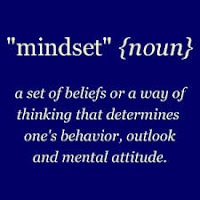 Two mindsets, yes; but those are not the two. According to psychologist and author, Carol Dweck, the two mindsets are labelled "fixed" and "growth." I see no conflict between the two writers. There is only one step. But, it is not easy. It is a process to which you must dedicate yourself to follow through all the ups and downs, the ins and outs, the successes and failures, the obstacles and achievements, and after all that, to realize that you have only just begun. Some teachers have made the mistake of emphasizing the first part of this verse, and making it our moral obligation to avoid conformity to the world. That sort of thinking gives rise to all sorts of rules and regulations about what you wear and where you go and who your friends are. However, if you will carefully consider that the verb is passive, you will see that it is something that happens to you. The second part of the verse tells us how to avoid being conformed, ie. being transformed--again passive in nature. The word "renewing" (KJV) is a noun, or in English grammar, a gerund. Okay. Now that the egghead session is over with, what is Paul trying to tell us? Paul is saying that the only way we can change things is for us to change our thinking. Some will say, "But I have no control over my thoughts. They just show up all by themselves!" Yes. That is true. They do "just show up." However, you do not have to pull up a chair and offer them hospitality. There is no law nor principle anywhere that says your thoughts must stay, for they are who you are. While it is true you are at the effect of your thoughts, you are ultimately the one who controls your thoughts. You may not be able to immediately control what shows up in your mind, but you can control how long it stays there. The word translated "think" in the last line of that verse is a word that means "volitional thought." Therefore, the idea in this verse is "to bring your mind to bear" on these things the apostle presented. In summary, then, changing your mind is the step and renewing is the process. The step is simple; but the process is on-going. The best way to begin the process is to determine that you would like to change. Then pray and ask the Lord to help you in the change. Then commit Phil. 4:8 to memory, and whenever you find yourself on the dark side of your thoughts, change over to something positive as listed in the verse. Because you are trying to move from one mindset to another, this process will be long and arduous, but the fruit is wonderful to behold.